Brighton is a dynamic seaside town situated on the Sussex coast, within easy reach of London, just an hour on the train from Victoria station. 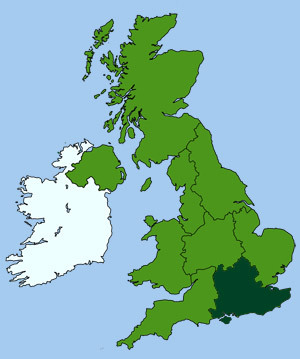 Also easily accessible by car via the M25 and M23 motorways. Once there you can easily walk everywhere and you will find the sea air very exhilarating. Brighton is a good place to shop and its central location on the south coast makes it a useful touring base. The Lanes, just off the seafront, is a fascinating area of winding alleys and hidden squares and passages. Here you will find stylish boutiques plus souvenir, antique and music shops. 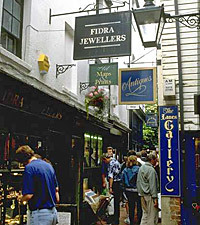 The Lanes is a popular celebrity choice for jewellery. There are also plenty of cafés, restaurants and traditional pubs. Near to the Lanes are many cultural activities such as the museum and art gallery. Another interesting shopping experience is the North Laine area close to the station where you will find many vintage shops and crafts studios. 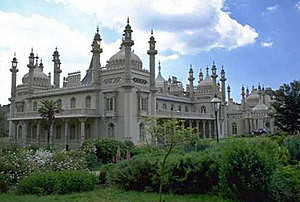 The exotic, multi-towered Royal Pavilion, a creation of the eccentric Prince Regent in 1787, is one of Britain's most remarkable buildings. Inside it has the most extravagant décor and is the venue for much lavish entertainment. If you love the sea go to Brighton Marina, just along the sea front in Kemp Town where you can enjoy a view of the boats and yachts from the water side. Also try to visit the Sea Life Centre on marine parade where the aquarium houses a fascinating selection of sea creatures. 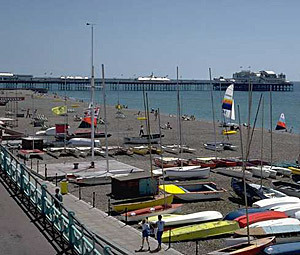 Brighton provides water sports during the day and a varied and vibrant night life. Its selection of nightclubs and discos are well worth a visit and the Regency Theatre will take you back to a bygone elegant era and then bring you back into the 21st century as this town has managed to do. 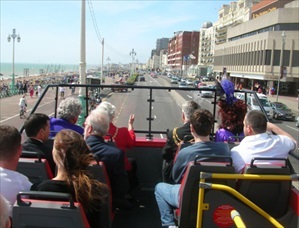 There’s no easier, more enjoyable way to explore this vibrant and popular seaside resort than the CitySightseeing Brighton hop on hop off buses. With stops around the city and along the seafront, you can simply hop off at whichever sight or attraction you want to see, then when you’re ready, hop back on and continue to the next. A recorded commentary is included, giving you fascinating facts and stories about Brighton. Location: The first stop is at Brighton Pier (Madeira Drive, Brighton BN2 1TW) but you can hop on or off at any stop along the route. Buses arrive approx. every hour.